We have often found ourselves explaining that we don't work with templates. It's not that we have anything against templates as such, but every design we create is made bespoke to the clients requirements based on an initial call we have with them at the beginning of the build. We like to think it's our unique selling point... let us explain why we think it's so great. There are a multitude of free, easy-to-use web design templates that are currently available on the internet. Some of these are ready built, cheap to buy and easy to apply. The issue we have with templates isn't anything to do with how they look or function, it's not even because we feel like our designs are better (check our our portfolio)! The reason we don't work with templates is because that template is not unique to you. Anybody can pick the same template and use it on their website, and for us, we feel that exclusivity is best. We want your website to represent your business, and to be consistent with your branding. We work with you on cultivating the exact design you are after, with our unlimited design policy. On-line is where first impressions really do count. It’s best to have your own unique design that can’t be found anywhere else. Of course web designs can be similar or have similar elements (you can't copyright code or development!) but you can have it bespoke made to your brand, your colour scheme, using your own images and of course your logo. Before you can have your own design created, you need to find a website design company that understands your brand. Here at Toolkit Websites, we have an initial call with you to determine what it is exactly that you need and whether we can fulfil it. The best thing about working with us, is that you are allowed to change your mind, you're allowed to express your ideas and suggestions. It's all part of the creative process. Or, if you'd rather leave it to the experts, we can create a bespoke design that we feel really suits your business. Hiring a web design company over buying a template also gives you peace of mind that not only will they make sure your website is mobile friendly, optimised and has the best chance in Google rankings, but it also means you have a support line if you need help or get stuck in the future. Get in touch today - contact us! 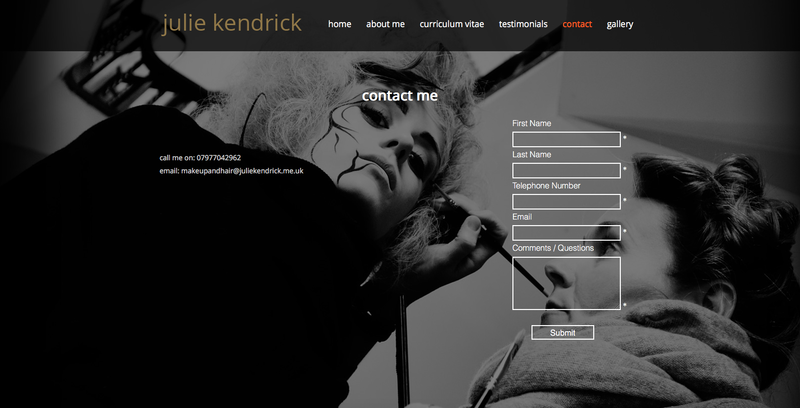 This week's website of the week goes to Julie Kendrick. Julie specialises in hair and make up, for the theatre, movie and TV industry. With some huge names on her list, such as HBO's Game of Thrones, Poirot and Les Miserables, Julie has professionalism down to a tee. Senior Project Manager Lanara, began firstly by creating a full background image website, using the hi-res images that the client provided. 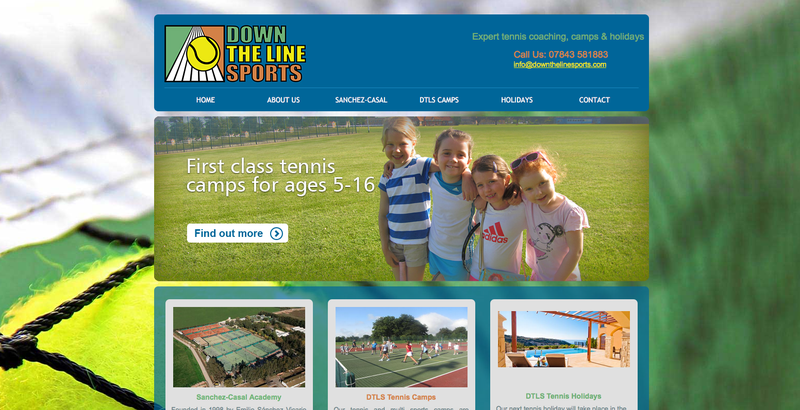 Keeping the font simple and the colour scheme minimal, the website oozes elegance and is a high end looking result. The website works as an online CV for Julie, to show case her quaifications and experence, as well as sharing details on what she has worked on and examples of her work. The main aim of the website is to be a place for people to find out more information and if they wish to work with Julie, they can simply get in touch via the contact page. The gallery features a number of thumbnails, that when clicked on, expand to show the original image. Very important when the images represent your work. Senior Project Manager Lanara made sure that each page followed Julie's brand guidelines. This included opting for lower case letters throughout the site. This stylistic choice makes the website look softer and adds a unique touch. The home page is where most people make a first impression about your business. This is particularly important for Julie as she IS the face of her business! We made sure the home page made a statement by selecting brilliant imagery, and slotting them together to flow together. The gallery thumbnails on the home page offer an insight into the work Julie has done, and have a hover over effect on each. The client was incredibly happy with the end result and kindly awarded us 5 stars out of a possible 5. "I've been incredibly happy with all work carried out and the help. You all literally get back to me within if not a few hours then a day." 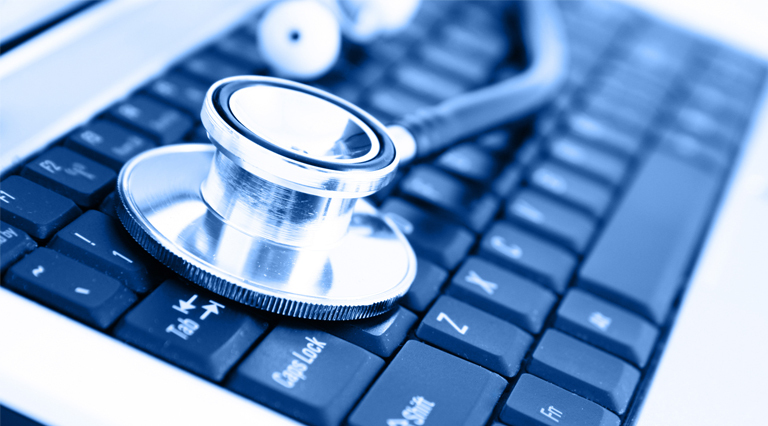 Why Should You Health Check Your Website? When you complete a website project and go live, many people tend to leave their website be and expect visitors to flood to the page. This is a dangerous mindset to have, because like any good party, you must send out the invitations! If you are a client of Toolkit Websites, you have a top class CMS (Content Management System) on your side. The Toolkit! Here you can update your website regularly, and implement brilliant SEO tactics that will help give you a boost. One of the features our CMS has is a health check, which tells you what areas of your website need some attention. Whether you need to add page aliases, you need to integrate your social media accounts or you need to take advantage of Google's free tools for Analytics and XML site maps... it will tell you. It's essential to perform regular health checks to make sure your website is operating at peak performance.Whether this is checking that your website displays correctly in different browsers and on different devices after you make any changes to the site. It could also mean keeping an eye on loading speeds and how the website handles heavy traffic. Your web designer will have performed all these checks before your website went live, but it's integral that you keep on top of things post-publication. For most people, building a website can be a daunting and frustrating task. Many people that want a website for their business don't keep in mind that the website needs to be created to respond to a users needs, and therefore needs to be built in such a way that will be relevant, useful and good quality to the visitor. One of the most important things that your site must have is content that is readable, easy to access and of good quality. Beautiful typography and swirly text is all well and good, but when it comes to people being able to decipher your web content, practicality must come above aesthetics. Making sure that your website is easy on the eye in terms of design, easy to navigate and that the font used is easy to read, should be top if your list. Google Fonts have a variety of styles and font faces to choose from, meaning that your typography can still be artistic and unique. Sometimes less really is more. Simple and minimal layouts are easier and much more enjoyable to navigate through. If you have a website with pages that are loaded with content, boxes and call to actions it can be difficult to know where to start. Avoid people bouncing from your site by leading them into your content with ease. 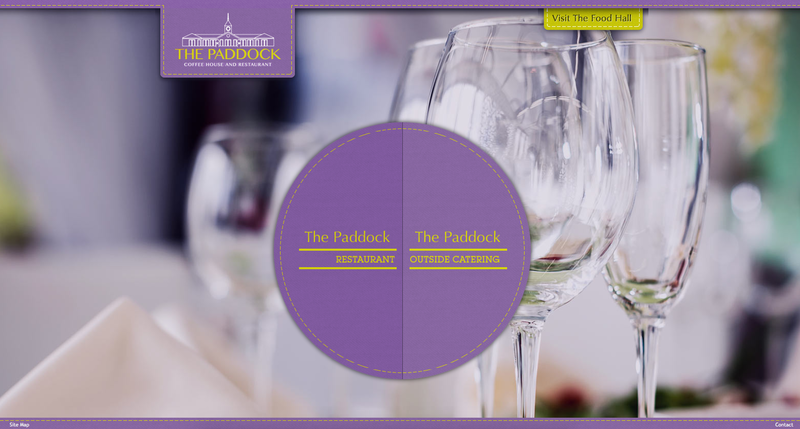 Full width panel websites with a gentle scroll are perfect for a home page first impression. Internal pages can be more content rich if need be, but layouts should break up the text to be easier and readable chunks. The easier it is for people to get to your website pages the better. You should always have your main page navigation in the menu bar in a fixed position on your website. People are used to this being at the top so that they can flick to the page of their choice and back again. If you do have links from pages to other pages, make them clear and make them relevant. Your website doesn't have to house all of the information about your business. In fact, giving them a taster of what you do and what you have to offer will entice people to get in touch with you to learn more. Only having the content that you need will make your website relevant, better quality and more enjoyable to navigate. At the end of the day, these are the types of sites Google favour, and that will ranking highly in search results. 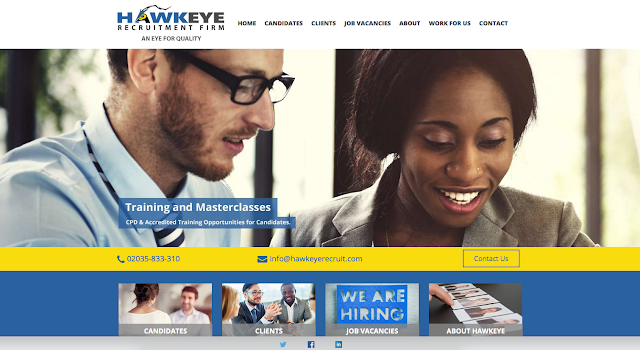 This week's website of the week goes to Hawkeye Recruitment Firm. At Hawkeye, they pride themselves on their purpose, that is: finding the right quality people for employers’ highly specialized, hard to fill positions! Senior Project Manager Lanara, began firstly by creating a responsive website design following the clients brief. The website needed to be a clean professional website, with strong call to actions and a clear and easy to follow navigation. The website uses a full width panel layout, each panel bespoke made to the clients requirements. The home page features boxes that link through to pages they would like to highlight, as well as a slide show with captions for each frame. Each panel is stylised and created to fit the contents purpose. The main aim of the website is to be a place for people to find out more information and to visit the list of job vacancies available. The footer that features on every page houses all of the useful information along with contact and social media information. The contact page features a full width map for location, and an easy to use contact form to capture any enquiries or questions. There is also a bright yellow banner which a call to action button for those looking to get in contact. Senior Project Manager Lanara made sure that each page follows the brand guidelines. The panels are either white, blue or an image panel. Each page is different but they follow a consistent style. The imagery was chosen carefully to reflect multi-ethnicities as well as sexes. There are a number of abstract style graphics and images used to reflect certain topics as well. The candidates page features an email alert button, in order to capture a persons contact details in order to alert them of future job vacancies or related news. The jobs page features a third-party iframe for a program that stores and utilises the job vacancies. The about page features an attractive time line of the company and it's progress, which is a different way of displaying information to just having plain text. We created a favicon that appears next to the business name in the browser window. This was taken from their logo, and uses the small eye shown in the lettering. "We are completely satisfied with the service received! Customer Service, flexibility and reliability are all given five stars! What is great Toolkit Websites is the consistent communication between project managers and their customers, and admirable understanding of what we need, bringing this to life to reflect exactly what we wanted! This makes for top-quality service worthy of praise. For this reason will certainly use Toolkit websites for other smaller/upcoming project websites, and will spread the word about the impeccable service!" Do you have a recruitment website that you would like to get started? Contact us! Crowd Sourcing; What is it and how is it done? Crowd sourcing is where you can get work or funding (usually online) from a crowd of people. The idea is to outsource ideas, funding or even skills from outside of your business or office. Wikipedia remains one of the most famous examples of crowd sourcing. Rather than creating an encyclopaedia alone or hiring anyone to write the articles they simply opened it to the public to come forward and create the information off of their own backs. The result of this is one of the most comprehensive on-line encyclopaedic available. 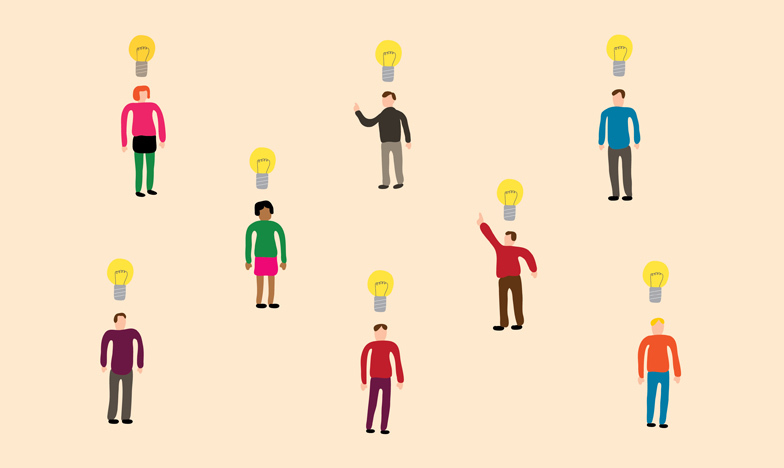 The idea behind Crowd sourcing is really quite simple. That the more ideas, hands or skills the better. By canvassing for these qualities, the end result will be superior. 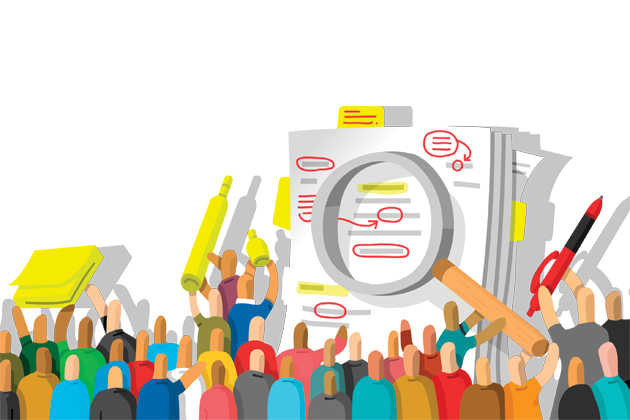 There are different types of crowd sourcing depending on what your business is about. For example, you could crowd source to find people with particular skills you are looking for. Graphic designers, web designers or developers may be interested in rising to the challenge of creating a logo or web page for a project that intrigues them or would be a beneficial addition to their portfolio. Not only does this mean you are giving your business a boost of awareness, but you're giving people the opportunity to come forward and provide you with ideas and suggestions you might have otherwise missed out on. For example, the Olympics committee launched a competition for people to have a go at designing the Tokyo Olympic logo. Crowd funding is slightly different in the way that it's asking for monetary contribution to a project or business start up. You can use a crowdfunding platform, set a goal for the amount of money you'd like to each and a deadline. Businesses that are most likely to use crowd funding include charities, film and production or start ups such as website applications or browsers. 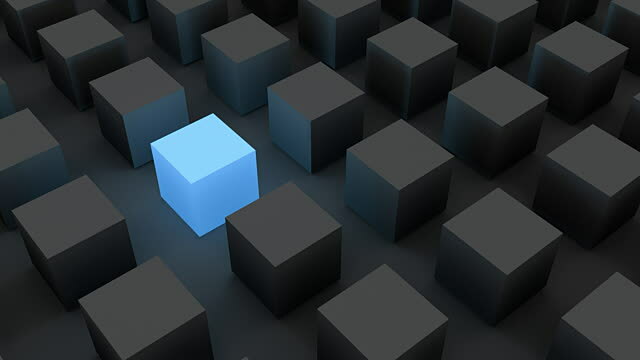 Open innovation is a similar concept to crowd sourcing, in the way that is opens up an idea of business model to people from all aspects of business such as investors, designers, inventors and markets. The idea is that they collaborate, by pitching in with their expertise, with the idea that the end result would be a profitable business reality. Open innovation opens up network channels meaning people from all over the world can connect and collaborate. It can also drum up interest and awareness of your business and your project. The main benefit to crowd sourcing is the ability to receive better results, ideas and utilise other peoples skills. Results can be delivered quickly and accurately, and in a marked out time scale. The only thing you should be aware of is that organisation is key to crowd sourcing or funding. Being able to manage a host of people and make sure all ideas come together and work in harmony, is a task in itself. First of all, what on earth is Schema Markup? Schema markup is a new form of optimisation and is known for being a particularly powerful tool when it comes to Search Engine Rankings. Once you've gotten used to the concept and method of schema markup, you can boost your website in the search engine result pages by using it for the pages of your website. Definition: Schema mark up is code (semantic vocabulary) that you put on your website to help the search engines return more informative results for users. 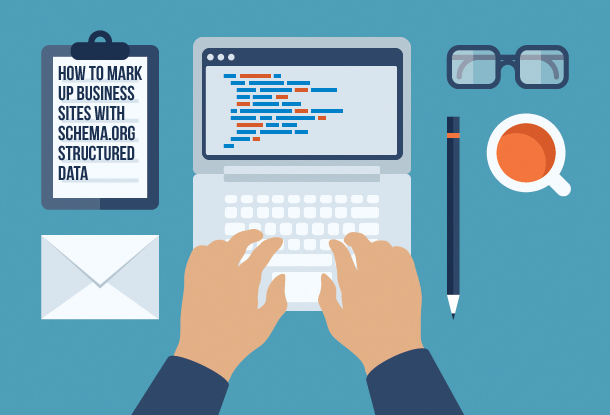 Schema markup tells the search engines what your data means, not just what it says. The content on your website gets indexed and returned in search results that use the phrases or keywords included within your content. If your content is relevant and well written, it is likely that Google will offer up your website as a relevant and good search result. With schema markup, some of that content gets indexed and returned in a different way depending on what the content is for. For example. A schema markup could be applied for a schedule of events/ times. A cinema such as Odeon has listings for it's film times. When you search for film times in your local area for a particular movie, it's useful for the times to pop up in the results page without you even having to click on the link! Schema markup uses a unique semantic vocabulary in microdata format. When a website has this markup in place, the search results can identify what the website is about, what they do, pricing and other information in a more uniform and easy to find layout. This is great for the user and for getting accurate and relevant search results... and Google in particular will like this because their end goal is to provide the user with the best experience. It goes hand in hand. So how do you add Schema Markups to your site via Google? Simply visit the website and follow the steps. Select the type of data that you want to markup, such as articles, blog, book etc. There are 642 Types overall to choose from. Once you've completed all the steps, all you need to do is make sure that the Schema Markup is added into the HTML source code of your website pages. It really is that simple. If you would like to discuss ways in which to improve your overall Search Engine Optimisation for your website with us, simply contact us. 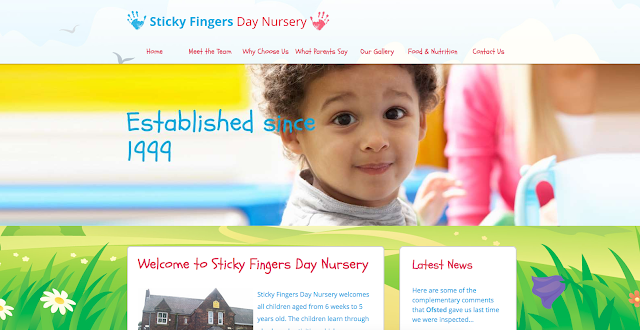 This week's website of the week goes to Sticky Fingers Day Nursery. Sticky Fingers Day Nursery welcomes all children aged from 6 weeks to 5 years old. Senior Project Manager Andy, began firstly by creating a design following the clients brief. 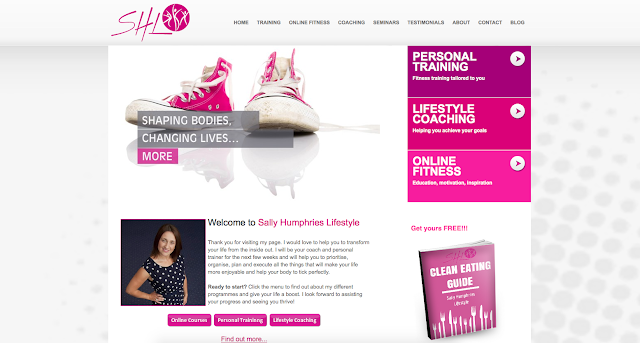 The website needed to reflect high energy, friendly, approachable and colourful! The website uses a clean looking design, meaning that the neutral colours look professional, and the imagery softens the overall look and feel. The website features a backdrop image of a cartoon style landscape which features flowers, trees and birds. The main aim of the website is to be a place for parents to access information about the nursery and how it works on a day to day basis. Whether that's the food and nutrition, what other parents have said about the nursery and images of the nursery itself. The contact page features a form for people to get in touch with any queries or questions, making it easy and hassle free. The pages are easy to navigate and the site uses a simple page structure to follow. The contact page also features a Google Map for easy directions. Senior Project Manager Andy added the important accreditation logos to a panel at the bottom of the website. These include the food hygiene rating, Ofsted logo and memberships. The client loved the layout and design of the finished product, in particular the large image slide show on the home page that really sets the scene. Do you have a nursery that needs a website? Get in touch today! Yes, we have a new website! We've taken our own advice, and redesigned our website. You may recall a blog post we published a while back titled "How often should you redesign your website?" "It might be that your website is outdated. 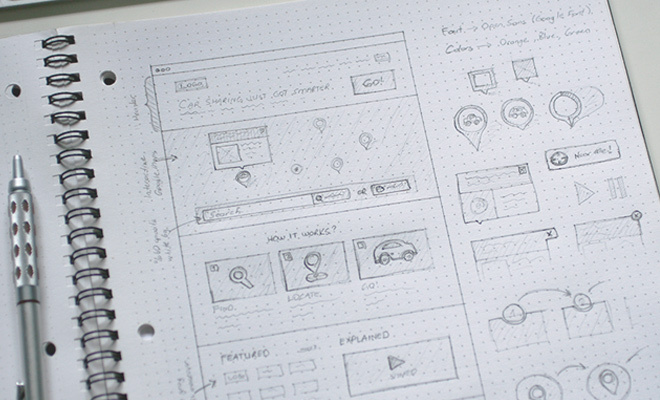 In the web design industry, trends come and go. New functionality is introduced and improvements are made to the platform. At this moment in time, full width panel websites, with parallax scrolling are 'in'." Now that responsive design is becoming the standard for web design, we took it upon ourselves to redesign our website and migrate from our mobile platform to our responsive platform. Now, the website resizes to any device, thus replacing the need for a dedicated 'mobile version'. What is the difference? Take a look here. We've also gone for a much cleaner, modern looking design. We've steered away from the slide show, we've favoured flat design styled graphics, and we've reduced our content and cleaned up the layouts. We've stopped worrying about 'the fold' as should you! And the website pages are now panelled layouts with more scroll which is now the norm. Did you want to take a look at our portfolio page? 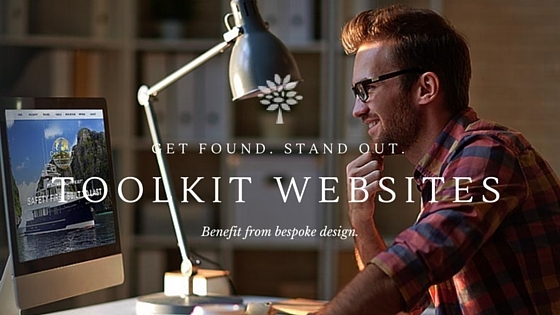 Find out what other people have done to overhaul their website design. When it comes to choosing a colour in Web Design, there are now a lot more options and variety than there used to be. We now have a selection of over 16, 777, 216 colours, when it used to be a smaller selection out of 216 colours that had to suffice. With the predominant colours red, green and blue being used in Web Design, each has 256 shades that can be combined together to form virtually any colour you want. Each of them has a hexadecimal value, made up of a three part algorithm using varying intensities of R, G and B. However, when it comes to the web, you need to be mindful of the fact that all screens can, and will, display differently. Neon colours, for example, may not appear as bright or "neon" as they look on paper. It really is a case of trial and error to see what works. Many studies have been conducted to see what affect certain colours have on individuals and what feelings and emotions they evoke when linked to brands. This in turn can explain why certain brands have selected the colours they have. For example: Blue is a very popular colour among professional or corporate businesses. Facebook, Twitter and Sky all use varying shades of blue in their branding and promotional material. In study called Impact of Color in Marketing, researchers found that "up to 90% of snap judgements made about products can be based on colour alone (depending on the product)." Additional studies have revealed that our brains prefer recognisable brands, which makes colour incredibly important when creating a brand identity. Brands such as Tiffany for example are well known for their colour scheme. Coca Cola, and also EasyJet are other examples of strong colour brands. It’s the feeling, mood, and image that your brand creates that play a role in persuasion. Be sure to recognise that colours only come into play when they can be used to match a brand’s desired personality. When selecting a colour for your branding, the main thing you need to think about is how you want the company to be represented, if it's something that will be remembered and that it fits with your target audience. The colour is not the be all and end all of a business or brand being a success but doing some research doesn't hurt. For example men seem to prefer bold colours while women prefer softer colours. However, that doesn't mean that if you are a personal trainer focusing on women as your clientèle that you shouldn't use bold, eye catching colours. It's simply a case of personal choice and what you think will work for your business branding. If your business is corporate, it makes sense to have a corporate colour scheme. Blue, white and light grey for example is a great combination. It's subtle, but not boring. Or, if your business is aimed at young children and you run a day centre, then bright, bold, clashing colours are more likely to represent your fun and energetic business. 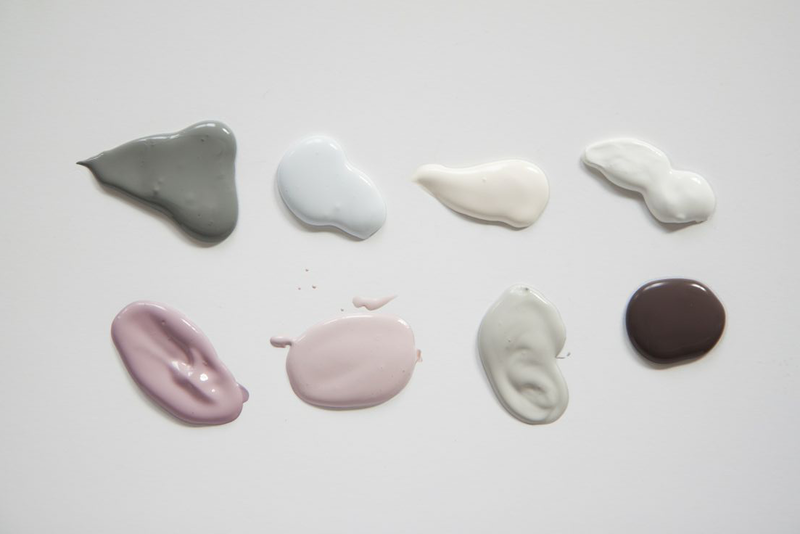 See some examples below of strong colour branding and make up your mind whether you feel they work or not! A bright colour scheme, using the yellow from the tennis ball and a suitable blue band.